In conjunction with the Consumer Product Safety Commission (CPSC), furniture manufacturer Ameriwood announced it is recalling 1.6 million of its Mainstays brand chests of drawers due to a tip-over risk. According to the CPSC, the product is unstable and poses a potentially deadly hazard to children. A 4-year-old was reportedly injured when one of the dressers fell on him. One of the recalled Ameriwood Mainstays dressers. Please see the CPSC recall page for a complete list of associated model numbers. Consumers who own this product are advised to keep it away from children until it can be secured appropriately. If you have one of these chests of drawers, you should contact Ameriwood directly at 888-222-7460 for a free repair kit that includes a wall anchor. Dressers and similar furnishings can be a tip-over risk if they are designed or manufactured incorrectly. 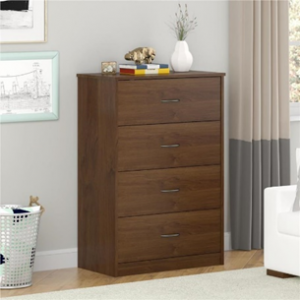 Some dressers are designed or constructed so that too little weight is placed in the back of the dresser. If not enough weight is anchored in the rear of the dresser, it can tip over when a small amount of force pulls the dresser forward. Defective furnishings contribute to thousands of severe injuries every year, and young children are especially at risk. The Oklahoma injury lawyers at Carr & Carr Attorneys at Law have helped many families who suffered tragedy because of defective dressers and other furniture. If you or a family member was injured due to a defective product, please call Carr & Carr at 888-232-5158 or contact us online to arrange your free consultation.